Our kitties can be slippery little suckers when they want to see what’s outside that magical front door. There’s no time like the present to make sure you’ve put everything in place to bring them home quickly, should the worst happen. Here’s what you need to do. It sounds simple, but if you stop and think about it, when did you last check your cat’s microchip details? It’s alarming how many times lost pets can’t be reunited with their owners because details are not up to date. In Australia, all microchips are now consolidated in a single database. It’s easy to create an account and manage your pet’s details online, so there’s no excuse not to do it! Don’t put it off, visit the Central Animal Records database now to get started. If you’re not located in Australia, a quick google should find your local database. While you’re at it, remember to update any changed details with your local council. So often, cats are thought to be lost and far from home when they are most likely only a street or two away. They end up travelling even further when would-be rescuers collect them and take them home, to the vet or the pound. Consider giving kitty a tag with your street address on it, as well as your phone number. This way, if someone finds them close by they can bring them home straight away. These days, most pet welfare organisations recommend that cats stay indoors. But anyone walking down the street is bound to see furry faces peering out from under cars or scurrying into the bushes. They’re out there doing their thing! 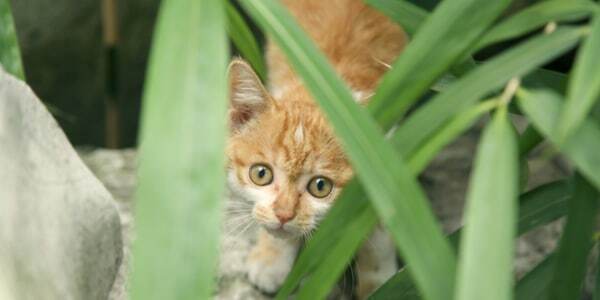 If your kitty is going to be a lone ranger, limit the time they spend outside to an hour a day. Train them to come home often and when called. It’s easier than you think – every time your cat steps inside, immediately give them a treat. Combine this with shaking their food when you call them in. With repetition, kitty will learn to come back sooner rather than later. There are plenty of resources available to help give you the best chance of finding your missing cat. Make sure you use them! For example, Missing Pet Partnership provides information on how your cat is likely to behave if they become lost, the steps you need to take, search techniques and even what to do if you find a stray or missing pet yourself. With all of this in place you’re giving yourself and your cat the very best chance of success, should they go missing one day. Once you’ve completed these steps, why not remind a friend to check their microchip details too? This entry was posted in Cat behaviour, Cat happiness, Cat health and wellbeing, Cat training. Bookmark the permalink.